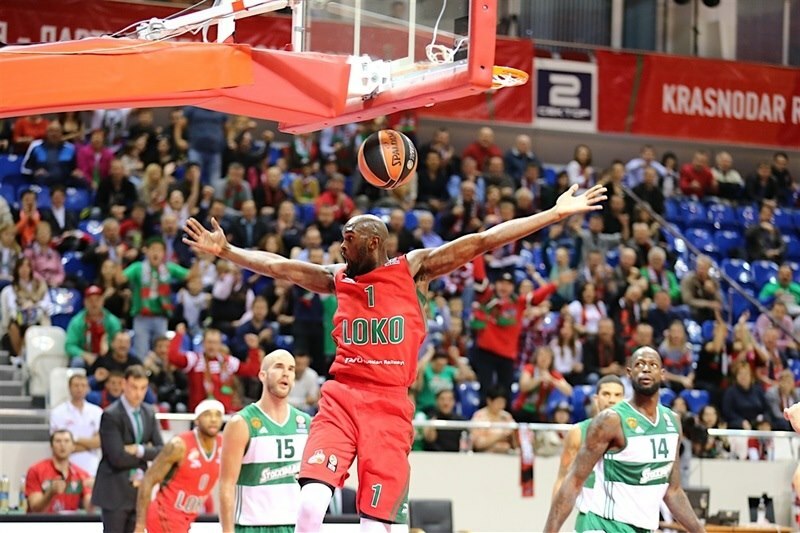 Lokomotiv Kuban Krasnodar returned to the Turkish Airlines Euroleague in the best way possible by downing Panathinaikos Athens 81-70 at home in Group C on Friday. Chris Singleton led the winners with 16 points and 9 rebounds. 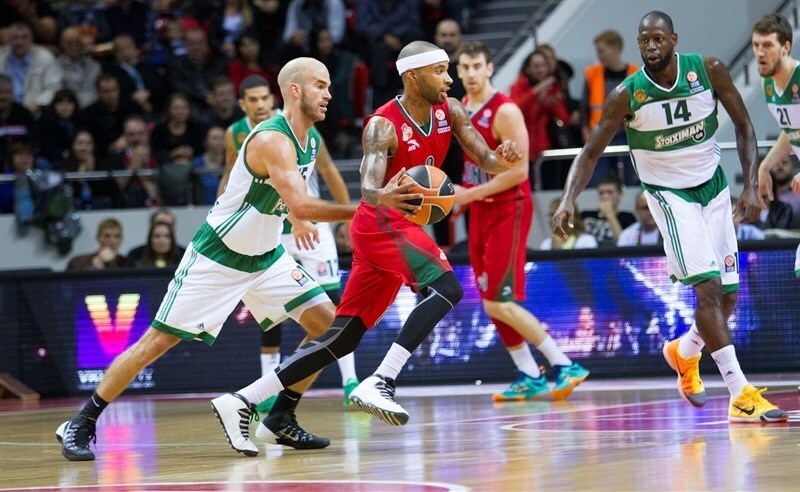 Malcolm Delaney added 14 points, while Victor Claver scored 13 for Lokomotiv. Miroslav Raduljica led Panathinaikos with 15 points, Dimitris Diamantidis added 14 and Nick Calathes tallied 13 points and 7 assists for the guests. 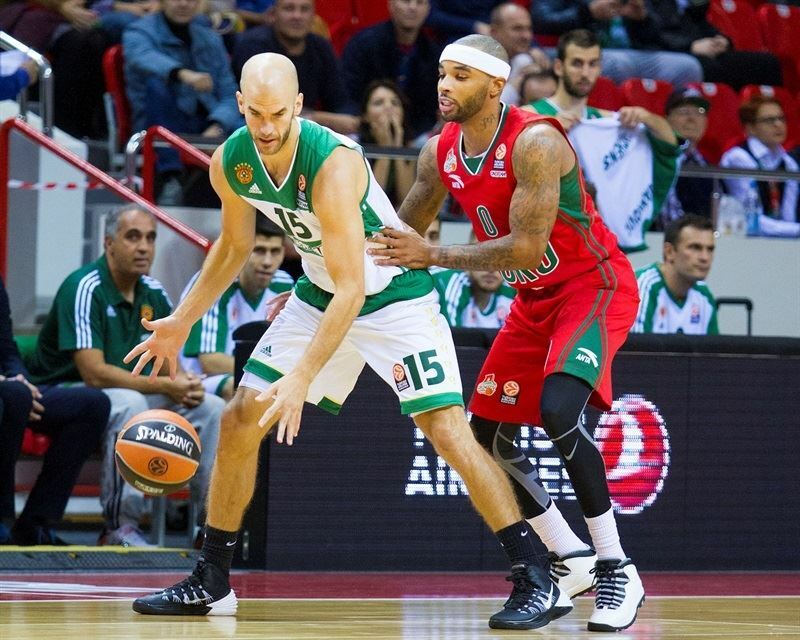 Sasha Pavlovic and Calathes fueled a 0-10 run which gave Panathinaikos an early 4-14 lead. Lokomotiv got within 17-21 at the end of the first quarter and got the lead, 30-29, on a layup by Claver. Delaney and an outstanding Claver allowed Lokomotiv to improve its margin to 45-41 at halftime. Back-to-back three-pointers by Diamantidis put Panathinaikos back ahead, 60-61, but Delaney also struck from downtown for a 63-61 Lokomotiv edge at the end of the third quarter. Lokomotiv found a go-to guy in Singleton, who followed a step-back triple with a wild three-point play in a 12-0 run that sealed the outcome, 79-67, in the final minutes. 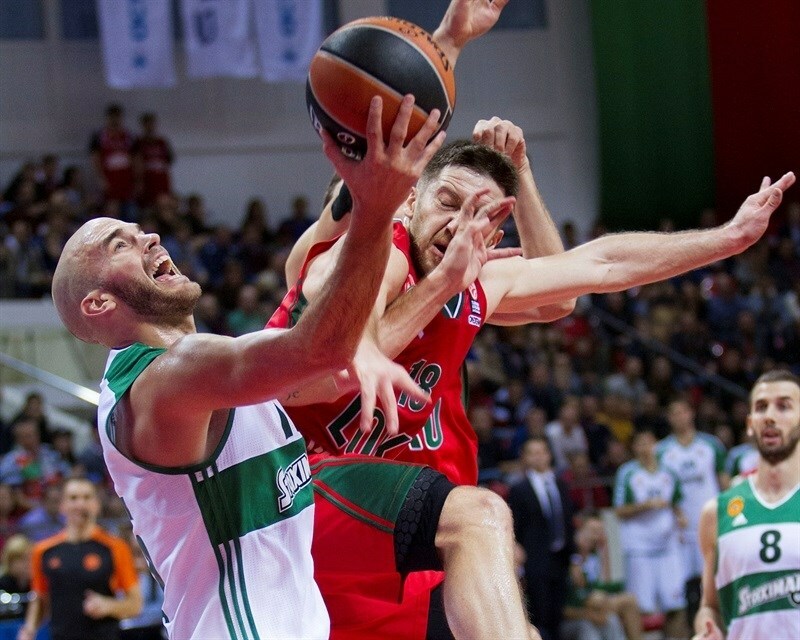 Raduljica got Panathinaikos going with an uncontested dunk, as Lokomotiv was held scoreless in the opening two minutes. A fast break layup by Pavlovic gave the guests a 0-4 lead. Chris Singleton stepped up with a second-chance layup and a dunk that tied it at 4-4. Raduljica sank free throws and a fast break slam by James Feldeine restored a 4-8 Panathinaikos edge. Pavlovic scored around the basket, prompting the hosts to call timeout at 4-10. Calathes shined with another fast break basket and James Gist copied him right after that to make it a double-digit game lead, 4-14, after a 0-10 run. Andrey Zubkov scored in transition and a big basket by Dontaye Draper got the crowd involved at 8-14. Singleton split free throws and Diamantidis sent a great pass to Antonis Fotsis, who gave Panathinaikos a 9-16 lead. Zubkov hit foul shots, but Gist shocked the crowd with an alley-oop slam and a tip-in by Singleton kept Lokomotiv within 13-18. Andrei Zozulin scored off a steal and a jumper by Delaney, but a Calathes triple restored a 17-21 Panathinaikos lead after 10 minutes. 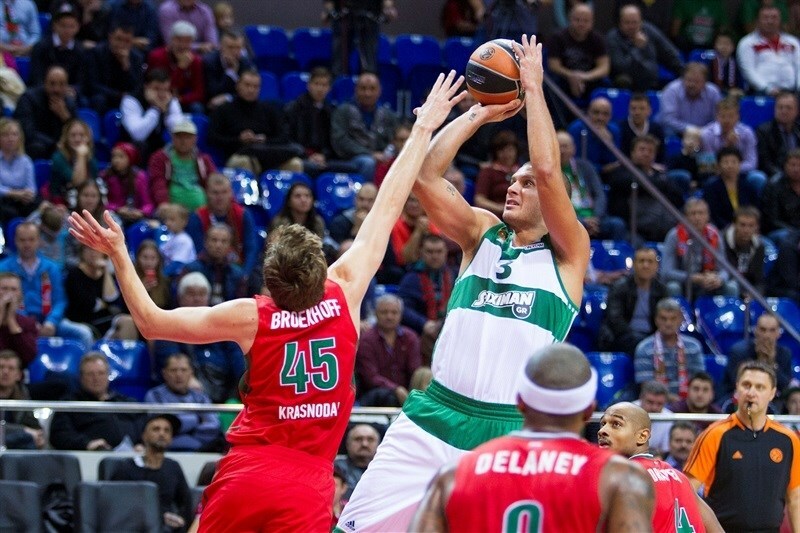 Diamantidis hit an off-balance shot early in the quarter, but Kyrylo Fesenko erased it with a jump hook. Raduljica made free throws and Diamantidis found Vladimir Jankovic for a fast break slam that boosted the Greens' lead to 19-27. Draper struck from downtown and soon added a fast break layup that caused Panathinaikos to stop the game at 24-27. Fesenko took over with a big basket in the low post, which Fotsis matched with free throws. Claver scored twice around the basket to complete Lokomotiv's comeback at 30-29. Diamantidis hit free throws and a floating layup by Feldeine gave the guests fresh air at 30-33. 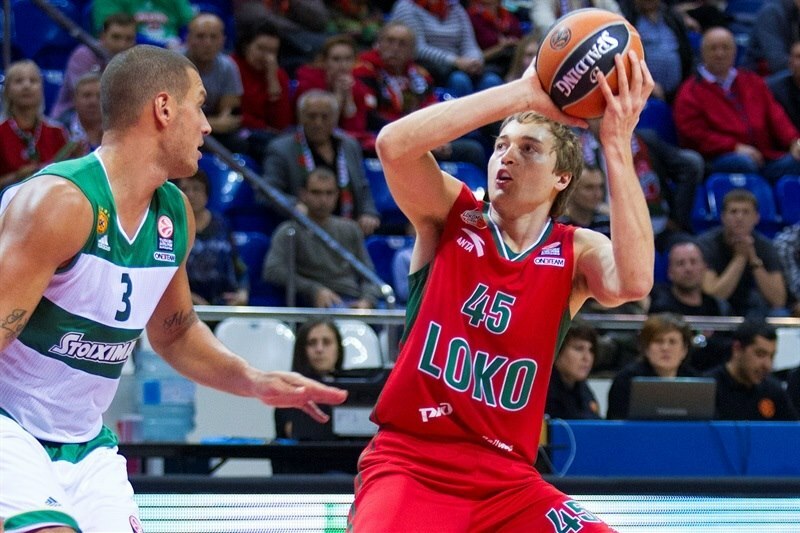 Claver kept pushing Lokomotiv with an off-balance layup and Ryan Broekhoff tied it at 33-33. Raduljica made foul shots, but a red-hot Claver gave his team a 37-35 edge. Delaney hit free throws and Evgeny Voronov bettered Raduljica's jump hook with a corner triple. A free throw by Diamantidis and three-pointers by Delaney and Calathes fixed the halftime score at 45-41. Voronov found space for an uncontested layup immediately after the break, as Lokomotiv tried a zone defense. 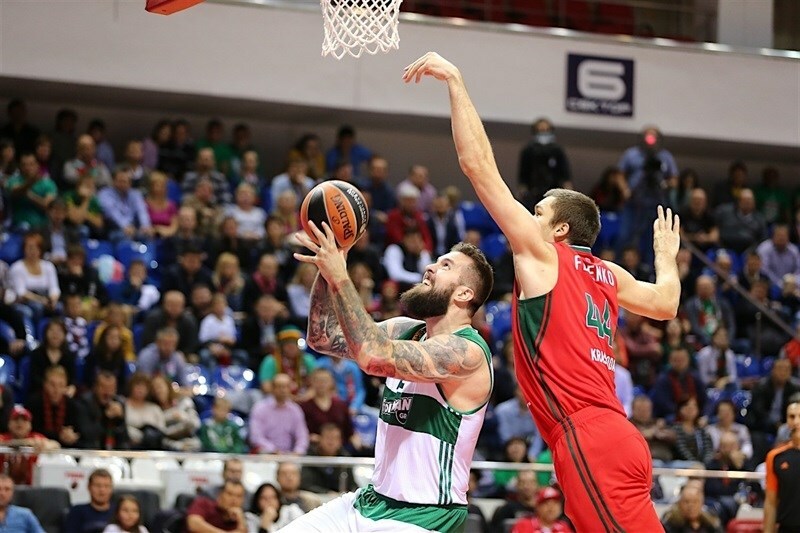 Raduljica punished it with a back-to-back layups, bringing Panathinaikos within 47-45. Singleton split free throws and a three-pointer by Broekhoff boosted the hosts' margin to 51-45. Ognjen Kuzmic scored down low and Feldeine followed a wide-open triple with a one-handed floater to bring the Greens within 53-52. Delaney nailed a mid-range jumper and provided a highlight with a driving layup for a 57-52 Lokomotiv lead. Panathinaikos missed several open shots until Calathes stepped up with a wild three-point play off a midcourt steal and Diamantidis struck from downtown to put the Greens back ahead, 57-58. Claver answered from downtown, but Diamantidis hit another one from beyond the arc for a 60-61 Panathinaikos lead. Delaney joined the three-point shootout to put Lokomotiv back ahead, 63-61. Sergey Bykov found his first points early in the quarter and a layup by Fesenko gave Lokomotiv a 67-61 lead. Fotsis hit his trademark catch-and-shoot triple from the top of the key, but Fesenko scored again in the low post. A layup by Calathes kept Panathinaikos within 69-66 with over six minutes remaining. 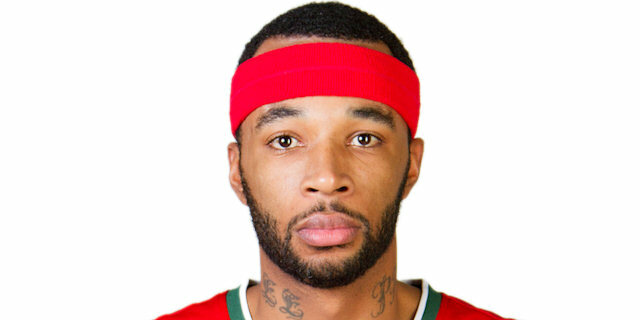 Lokomotiv improved its defense right when it mattered most, but a free throw by Raduljica made it a 2-point game, 69-67. Singleton took over with a step-back three-pointer, after which the Greens call timeout. Lokomotiv kept running its offense through Singleton, who ignited the crowd with an off-balance layup-plus-foul that broke the game open, 75-67. Panathinaikos kept struggling to score and a layup by Zubkov sealed the outcome with two minutes left. By the time Zubkov scored again, thousands of Lokomotiv fans were celebrating that their team had returned to the Turkish Airlines Euroleague in style. "It was our first game this year in the Euroleague and of course we’re very happy that we won. We played against a very experienced and very talented team, and that’s why this win is very important for us. At the same time as everybody knows we had a lot of problems in our preseason with many injuries and right now we’re playing without Anthony Randolph and Nikita Balashov. And Dontaye Draper was injured and had just one practice ahead of this game with the team. 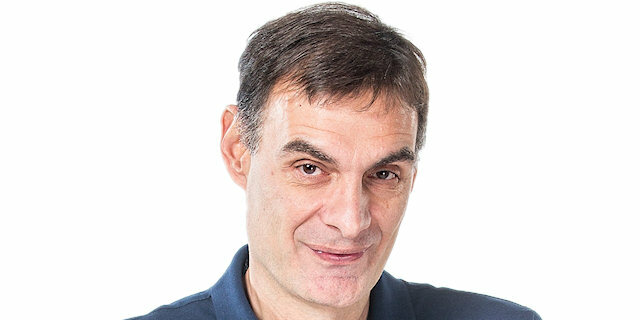 In the first ten minutes when our approach to the game was not so good, maybe having many newcomers and many new players to the Euroleague played its part. They needed some time to adjust. Then we had enthusiasm. We took something like 15 more rebounds than Panathinaikos, and this is always crucial for the win." "I congratulate Lokomotiv on a great win. I think they deserved the win with the way they played. They played great and intense game. We opened the game good, but Lokomotiv has a long bench and everybody who entered from their bench gave something to their team. I think it was the key, and we didn’t have all our players involved into the game as we’re used to. We had 10 or 11 turnovers in the first half and most of them in the second quarter, when Lokomotiv Kuban managed to get back into the game. We fixed that in the second half, but in the end of fourth quarter we had lot of open shots that we couldn’t make and we let them score with our hands down on very important attempts. We’re the team with a lot of experience and we cannot make such mistakes. Another key for Lokomotiv was rebounding; we shouldn’t allow opponents to outrebound us like that. Maybe a little bit of our energy went into all those trips we had recently; this is the second time in Russia this season, we’ve also been to China. We need to get our energy back for our future games, especially for the one that is in front of us in two days against Olympiacos." 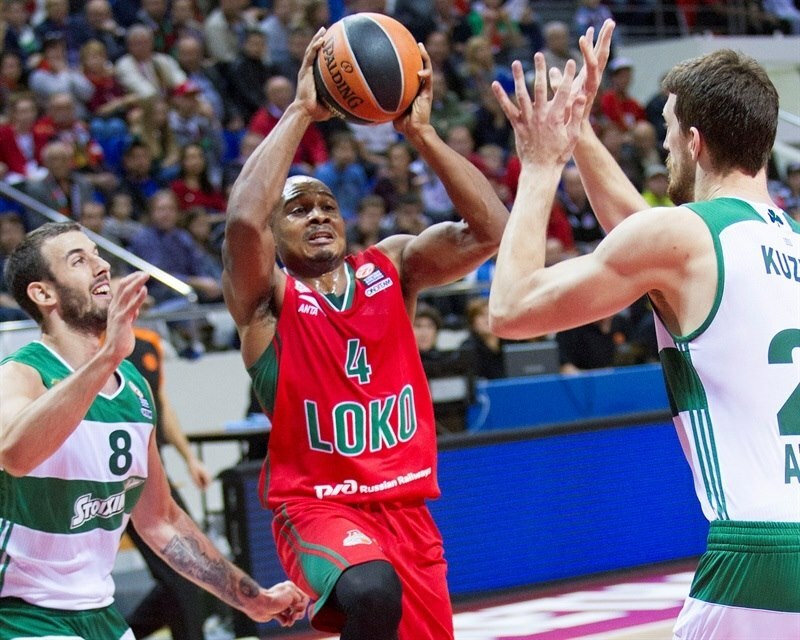 "[It’s]Good to be back in the Euroleague playing; it’s a lot more fun! For the opening night at home we really came together and played good against one of the best teams in Europe. It’s also good to get coach a win against Panathinaikos, I know he struggled with them. I think we have a good mix of guys, veteran and young players, and team atmosphere is really good. Coach did a great job picking some good guys, not just basketball players, but for the locker room. And it’s a big difference from last year. Being unselfish translates on the court."